What is the Jr. NBA? Who can become a Jr. NBA member organization? Any organization that has a youth basketball program/league/event that serves kids ages 6-14. This includes community-based youth organizations (e.g. Boys & Girls Club, Police Athletic League, Jewish Community Center, YMCA/YWCA, Parks & Rec organization, etc. ), schools, and youth basketball programs on military installations. What is included in my Jr. NBA member organization welcome kit? As a Jr. NBA member organization, you will receive a welcome kit based on the number of players in your organization. Welcome kits will include a Jr. NBA whistle with lanyard, Jr. NBA clipboard, and Jr. NBA padfolio. All items will be co-branded with Jr. NBA and Under Armour marks. Under Armour serves as the presenting partner of the Jr. NBA. Can I purchase additional Jr. NBA welcome kit materials? No. Unfortunately, these items are not for sale. How do I purchase Jr. NBA uniforms for my league? Please visit our “Outfit Your League” page to learn more. This will take you directly to the site providing uniform options and discounts associated with being a Jr. NBA member organization. Please submit an inquiry online and a representative will be in touch about specific discounts and printing options for your league. How do I get my league/organization involved in NBA special events and player appearances? The first step is to register your league with the Jr. NBA. Once you are a registered Jr. NBA league/organization, you will be considered to possibly host a future event at your facility, as well as be invited to participate in special events in your area. The Jr. NBA will keep you posted on all opportunities that become available in your area. How do I get access to the Jr. NBA grant funding? As a Jr. NBA member league, you will receive information on how to apply for possible grant funding for your league. What are my responsibilities as a league director/member league of the Jr. NBA? Jr. NBA Pledge. There are no costs or formal requirements associated with being a member of the Jr. NBA. How can I use the Jr. NBA marks and logos to promote my affiliation? Please email the Jr. NBA at jrnba@nba.com to receive a guideline detailing how your organization can properly use Jr. NBA marks and logos. Do my children need to play in a Jr. NBA league to have a family Jr. NBA membership? No. Any family with children between the ages of 6 and 14 may register for a Jr. NBA family membership. Jr. NBA family members are encouraged to have their local youth basketball program(s) sign up as official Jr. NBA organizations, or join a Jr. NBA member league in your area. How do I find a Jr. NBA league for my child(ren) to play? The best way to join a Jr. NBA league in your town/community is to approach the local organization in your area and encourage them to register their league for the Jr. NBA at www.JrNBA.com. As a Jr. NBA member, will I receive discounted tickets to NBA games? Discounted tickets are not a core offering of the Jr. NBA. However, NBA, WNBA, and NBA Gatorade League teams are interested in connecting with Jr. NBA member leagues located within their communities. If you are interested in being connected with your local NBA, WNBA, or NBA G League team, please email your request(s) to jrnba@nba.com. Do all my coaches need to be licensed by USA Basketball certification to coach in my Jr. NBA league? No, but it is highly encouraged. Jr. NBA member organization coaches will receive a discount towards coach licensing from USA Basketball. What is required to get a USA Basketball Coach License? 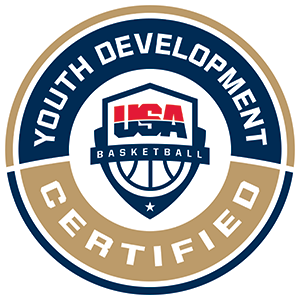 USA Basketball Youth Development requires background screening for all potential coaches and administrators. Background screening is one step to help ensure a positive and safe environment. The cost of the background screening is included in your registration fee, unless your county of residence requires an additional fee to process the background check. The SafeSport program was created by the United States Olympic Committee to address misconduct in sport and the practices to use to protect athletes. The SafeSport course addresses six types of misconduct and how to affectively deal with each. Learning about the types of misconduct is an important step to recognize, reduce, and respond effectively to inappropriate and harmful behavior. How long does a USA Basketball Coach License last? The USA Basketball Coach License for 2018-2019 will last from September 1, 2018 – August 31, 2019.